The house where we live is surrounded by shrubbery, small trees and other landscape features. A ground cover of rounded stream gravel was placed around most of these plantings by the previous owners. As a geologist, I have a hard time walking past these rocks without seeing an interesting pebble that begs for examination. This gravel was dredged from the Ohio River where a few erratic igneous and metamorphic rocks are mixed with the local sedimentary rocks. The igneous and metamorphic rocks were carried south, from Canada, by glaciers and meltwater streams during the Great Ice Age. They are most abundant in Ohio River sediments at the top of the West Virginia panhandle - where the glacier's closest approach occurred and decrease in abundance downstream as they are diluted by locally-derived sedimentary rocks. The igneous and metamorphic rocks in this gravel account for just a few percent of the volume but they are the most interesting rocks in the mix. I recently hand-picked several pounds of igneous and metamorphic rocks from these plantings that ranged from about one inch to three inches in diameter. I wanted to see how they would tumble. I picked rocks that were physically sound, not heavily weathered and had very tight grains. 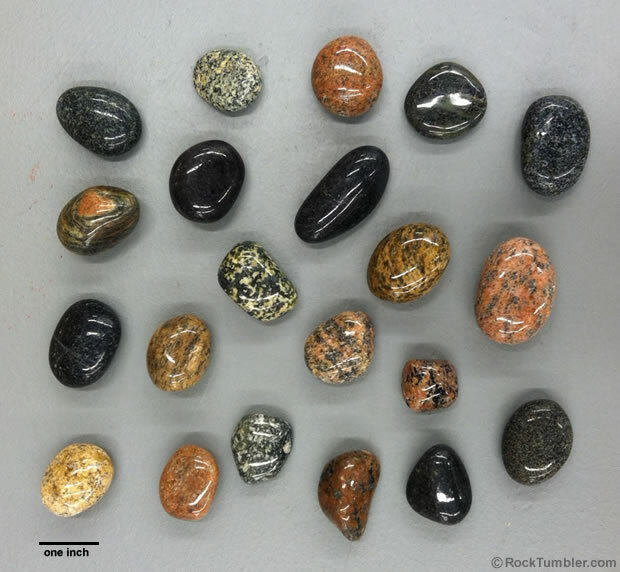 Only a few types of igneous and metamorphic rocks are commonly seen as tumbled stones. Unakite, Apache tears, snowflake obsidian and other varieties of obsidian are frequently seen. However, lots of igneous and metamorphic rocks will accept a nice polish. Think of all of the granite, gneiss, pegmatite and marble that is cut, polished and used for countertops, windowsills, floor tiles, cemetery markers and architectural uses. These rocks were cut from the Earth in a quarry and have not been subjected to weathering. Unlike quarried rocks, those dredged from a river, found in a stream, found on a beach or picked from glacial till have been subjected to weathering. This weathering creates a surface of altered minerals on the rock. If this "weathering rind" is thin, it can be removed by several days in the rock tumbler. However, if it extends deeply into the rock you have little hope of getting a nice polish. If you break a couple of rocks you might be able to determine how deeply they are weathered. How Well Did They Tumble? The rocks that we picked were mostly granite, granite gneiss, gabbro, diorite, and basalt. We placed them in a Thumler's UV-10 tumbler with about 50% ceramic cylinders, six ounces of 150/220 silicon carbide grit, plus a little water and ran them for three days (they were rinsed and fresh grit added each day). We then ran two days in 500F grit and two days in TXP polish with a couple shots of Dawn "Direct Foam" detergent (the Dawn provided bubbles that we believe provides some cushioning during the polishing step. We ended up with a lot of beautiful polished stones. Check out the granite, granite gneiss, basalt and diorite in the image above! A few of the rocks in our batch didn't want to polish. That's OK, we got a lot of nice ones.